Once a week, a special community writes for the pure love of the unedited word. We take just a few moments to spill our un-smithed thoughts, and share them with one another--and with you. I like it because by Friday, everything I have left is of the un-edited variety. 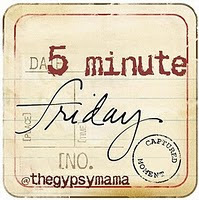 Five Minute Friday is specially hosted at inCourage today. There's even a giveaway to one random linker. You know you want to participate now! Would you believe God specially reminded me to BE STILL this week, and remember that He is with me. Psalm 46 is one of my favorites (along with about 50 others, ha!) and has always been a good reminder not to fret when I don't know what I am about. Because seriously, compared to GOD, what's left to worry about? I went to this marvelous conference last weekend (has it been a week already? ), and was left wondering where God was in the midst of it. At the tail end of the weekend, I remembered to visit the prayer room. And believe me, that holy ground was STILL. and along with it, the reference to Psalm 46. God's presence is always with me, and always supersedes any of my doubts. God is good. And I love when he works so perfectly to remind me that he is with me. Much more poetic post on this to come Monday. But I could not believe this was our prompt for today, after I just spent three hours smithing that other post! Good reminder to me to pull out Psalm 46 again and meditate on it over the weekend. This was beautiful. I have seen several posts so far about how touched the women were who attended SheSpeaks and found their name on the very spot they needed (that particular name of God). I love it when He does stuff like that! Psalm 46 is one of my favorites as well. It can often be challenging to be still and just know that He is God, because we're so busy doing. This was a great reminder for me today as I've been heavy in my doing and forgetting His power in the stillness. It is often in the stillness that God reveals who we are to Him and who He want to become in our lives. I have about 50 favorite psalms, too. :-) And, of my gosh, I love how you explained this... how you were feeling and how this name of God fits so perfectly. Truly perfectly. This, Krista, this I totally get: "I had worried that I wasn't close enough to God, that all the other women at the conference had a better line to him than I do." So glad you found God in the midst and were able to get your priorities straightened out. Thank God He helps us in those moments when we have everything backwards and upside down! Great five minute post, Krista. I am loving all the stories of lessons from She Speaks! I love how specifically and directly God is speaking to each ladies heart. And, like you said at the end of this post..."God is good. And I love when he works so perfectly to remind me that he is with me." His ability to do this never ceases to amaze.